Food type and target species: Complete food for cats. Composition: Cereals, meat and animal by-products (poultry),fish and fish by-products (tuna and salmon), oils and fats, by-products of vegetable origin and mineral substances. Vitamin A: 15.500 U.I./Kg. Vitamin D-3: 1.600 U.I./Kg. Vitamin E (a-tocophe rols): 80mg/Kg. 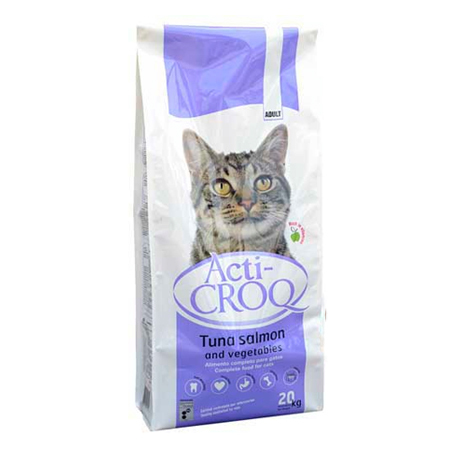 As well as the related vitamins, everything necessary is added for the normal development of the cat vital functions. Best before date and date of manufacture: It be utilizated preferably before the date consigned in the upper part of the packaging.. Recommended use per day: Shall be provided with clean, fresh water freely available. Feeding amounts may vary depending on environmental conditions.